​Marcy Arlin has been reading spec fiction since elementary school and seriously writing for 6 years. She studied with Chris McKitterick, Andy Duncan, Kij Johnson, Betsy James, Jill Dearman, and will attend the Writers’ Institute at CUNY Graduate Center next fall. Member: Brooklyn Speculative Fiction Writers, Broad Universe, Theatre Without Borders, No Passport, Lincoln Center Directors Lab. SF publications: The Broad Universe Sampler, Daily Science Fiction, PerihelionSF.com, Abandoned Towers, Man.In.Fest/Romania (her SF play), and was shortlisted for Apex’s Upside Down. She is Artistic Director of the OBIE-winning Immigrants’ Theatre Project, writes a blog on immigrant theater artists at tgcircle.org, and was editor ofCzech Plays: 7 New Works. 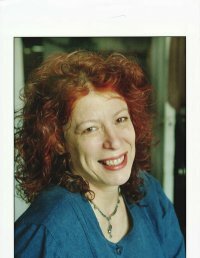 Marcy has taught theatre at Yale, Brown, CUNY, U. of Chicago, Pace, and many universities in Eastern Europe. Fulbright scholar to Romania and the Czech Republic. Lives in Brooklyn with her husband, cats, and folks from many nations, who inspire her and have great take-out menus.